You have probably forgotten you are an animal. More specifically, you are a mammal of the species Homo sapiens. I can state that fact with confidence because only Homo sapiens read books. You were born of a mammalian reproductive system, and you will die when your animal body gives out. Like other animals, you must breathe air, eat food, and take sleep to stay alive. But you probably don’t think of yourself as an animal, because your life carries on so differently from the lives of other animals. If you lived the life of an animal in the wild, you would spend most of your day searching for food, while keeping up a constant vigilance against predation, which is, of course, someone else’s search for food. Do you spend your day searching for food? Probably not. Do you fear becoming food for someone else? Not likely. Why are our lives so different from that of other animals? That’s probably not the word you were expecting. Most would consider our complex brain to be the most significant feature that distinguishes us from other animals, followed closely by our hands with grasping thumbs, and our language skills. Our advanced brain allows us to comprehend our environment and imagine how to change it. Our brain guides our hands in making tools that extend our capabilities, and enables our language skills which let us pass on those capabilities. These assets are necessary but not sufficient to explain how we ascended to our current modern life. The crucial difference emerged when we used these skills to control energy. When we learned to control fire, our first energy source from outside of our bodies, we permanently parted ways with the animal lifestyle. Our continued development has tracked a continuous escalation in our control of energy. It was energy that built modern society, and it is energy that runs modern society. Without energy, we would be just a talkative primate that walks upright on the savannah, hunting and foraging like other animals. With energy, we have built homes that provide security and comfort, food production systems that feed us reliably, and transportation systems that can carry us anywhere in the world. If all of our energy devices were taken away, then all this would grind to a halt. All manufacturing would stop so there would be no goods to buy. All transportation would halt so we would have to walk or ride a horse. And all food systems from farming to supermarkets would cease operating, so we would have to relearn primitive survival techniques. Imagine what you would do if no food were available in any store. The food is there because of energy. Energy is the key factor that separates us from other animals. Our ability to direct the flow of energy is a unique, defining characteristic of humans. We are the energy-using animal. As the energy-using animal, we are in a class by ourselves. We don’t observe squirrels building fires to keep warm, or chimpanzees driving around in cars. Only humans have mastered the skills to manipulate energy to serve our purposes. To be clear, all animals use energy in the form of food. Food contains chemical energy that powers the bodily functions that keep any animal alive. The human body has a digestive tract similar to other mammals, through which we derive the energy to power our hearts, minds and muscles. But for other animals, food is their only energy source, and food-powered muscles are their only means of accomplishing anything. When a wildebeest on the savannah needs to migrate to find fresh grass, it has no option but to walk there, powered by its food energy. Humans have learned to direct external energy sources—energy that originates from outside of our bodies, in quantities that far exceed the energy available in food. If we needed fresh grass, we would use gasoline energy to drive there, or better yet, have it cut, packaged, and express delivered. Using external energy multiplies our capabilities beyond muscle energy, enabling us to manipulate our environment like no other animal. The advantages humans accrue from energy have evolved into an ongoing relationship. The human relationship with energy has many facets, but it can be summarized as follows: We direct the flow of energy, and in turn, energy grants us great power over our environment. Few would doubt that humans have altered our planet, but how many realize that energy is the dominant factor behind those changes? Because energy is the agent underlying every action, every time we use energy we change something around us. The more energy we use, the bigger the changes we make. Because we have the ability to control energy, we direct those changes in ways that for the most part benefit ourselves. That control defines our relationship with energy. This relationship with energy started before we were fully human, when our prehuman ancestors learned to control fire to alter their local environment to survive. As our energy-using skills developed over time, we were able to safely direct ever larger quantities of external energy to accomplish ever greater tasks. Modern energy-powered machinery routinely levels mountain tops and erects skyscrapers. With energy, we have even shot the Moon, using liquid hydrogen energy to lift a total of twelve Americans to the surface of the Moon. With energy supporting us, our species has multiplied and spread over the surface of Earth. In cold latitudes, we use energy to keep us warm. In warm latitudes, we use energy to keep us cool. As we spread, we take over land, clearing it for farms, roads, and cities, and chasing off all the wild animals. The few wild areas that have not yet been taken over by humans continue to shrink as our population grows. Our wonderful mental abilities have enabled us to gradually recognize the effects of our planetary takeover. As we have studied and catalogued plant and animal species, we have noticed that the numbers of many wild species are dropping, sometimes to zero—extinction. So we put in place species preservation programs, investing time and energy to preserve wild habitat, and even resorting to controlled breeding when the numbers get too low. When the numbers get too high, we thin the herd, acting in place of the predators we most likely eliminated. We have shifted from being just a resident of Earth to being a manager of Earth. We effectively control life on Earth, in the sense of which species live or die. We like to think there are still wild places, but most are preserves that humans have set aside, circumscribed by boundaries that we establish, containing populations that we monitor. If other animals could develop energy-using habits, then they could compete with us. But they will not have that chance while humans dominate. All this control derives from energy, massive quantities of energy. The massive quantities are actually a relatively recent development. Up until the early 1800s, wood fire and animal muscle provided most of our energy, and both were self limiting: wood can be harvested only as fast as a forest can regrow, and animals take up land and food. The discovery of large caches of stored energy in the ground released us from those limits. Coal, oil, and natural gas are the fossilized remains of plants and animals that lived millions of years ago. When they died, their decay process was somehow interrupted, so part of the energy stored in their body tissues was preserved and condensed, gradually becoming the fossil fuels that we use today. With the development of coal, oil, and natural gas over the last two hundred years, our energy use became limited only by how fast we could pull them out of the ground and find new ways to burn them. We replaced dwindling wood supplies with seemingly unlimited coal in lime kilns to make cement, and in foundries to make steel. We learned to burn fossil fuels in boilers to make steam to generate electricity, and we learned to burn fossil fuels in engines to power cars, trucks, boats, trains, and airplanes. Each new use added more demand, and so the fossil fuel industries have grown almost continuously for two hundred years. It is hard to imagine that today we burn 89 million barrels of oil per day worldwide, and that oil is just one of three fossil fuels that we burn in massive quantities. The word “massive” hardly seems adequate to describe our energy use. Our marvelous brains also began to note the effects of all this burning. Initially we noticed the ugly air pollution that clouded our cities. We responded by applying technology to clean up the combustion process to emit fewer pollutants. Cars were fitted with catalytic converters, and coal plants were fitted with scrubbers. The skies over many large cities cleared. Now we face another side effect that is proving much more difficult to correct: carbon dioxide. When fossil fuels burn, the carbon in the fuel combines with oxygen in the air to form carbon dioxide, an odorless, colorless, nontoxic gas. The carbon in fossil fuels comes from those ancient plant and animal remains, and it carries the energy that we seek. Since forming carbon dioxide is necessary to getting at that energy, there is no simple technology to turn off the carbon dioxide produced by burning a fossil fuel. The release of carbon dioxide had previously been considered harmless because it is chemically inert in the atmosphere, unlike other pollutants that undergo smog-producing chemical reactions. Carbon dioxide has always been a natural component of the atmosphere that you inhale with each breath. Your own body produces it as a natural waste product, which you exhale with each breath. The problem comes from the scale of carbon dioxide emissions from fossil fuels. Worldwide we pump about 100 million tons of carbon dioxide into the atmosphere every day. In equivalent volume, we burp a bubble of carbon dioxide 3 miles in diameter every day. And unlike other air pollutants, carbon dioxide stays up there, because carbon dioxide is chemically inert in the atmosphere. The natural cleansing mechanisms that remove extra carbon dioxide from the atmosphere work much more slowly than the rate of our additions, so the carbon dioxide accumulates over the years. This accumulation is proving to be a problem because of a simple physical property of carbon dioxide—it absorbs infrared radiation. Infrared is the same as light but beyond the visible red portion of the spectrum. An infrared camera shows outlines of warm bodies glowing with infrared light energy. The Earth’s surface warmed by the Sun glows in the infrared range. The extra carbon dioxide in the atmosphere blocks some of the outgoing infrared energy that would normally escape into space. 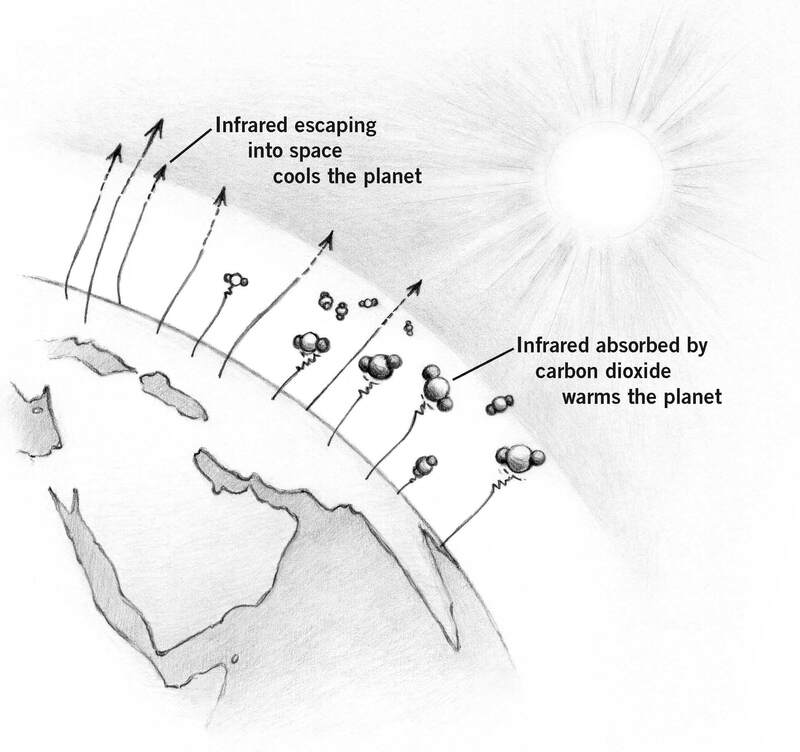 The infrared radiation that escapes the atmosphere carries away energy, cooling the planet. But some of the outgoing infrared energy is intercepted and absorbed by carbon dioxide, thereby warming the atmosphere. The extra carbon dioxide effectively turns the Earth into a giant greenhouse, with the atmosphere acting as the greenhouse glass that retains heat and raises the Earth’s temperature. The resulting global warming melts ice, raises ocean levels, and alters climate patterns. The evidence is all around us. But it gets worse. About a fourth of all the carbon dioxide emitted from fossil fuels over the last two hundred years has been absorbed into the world’s oceans. That seemed to be good news at first, because it slowed the accumulation of carbon dioxide in the atmosphere. But it is proving to have disastrous consequences for marine life. The carbon dioxide combines with seawater to form carbonic acid, which makes the ocean water more acidic, according to the Ocean Acidification Fact Sheet from the US National Oceanic and Atmospheric Administration. The oceans have no ready mechanism to neutralize the extra acid, so it accumulates. Shelled creatures have trouble forming shells in acidified water, because their shells dissolve as fast as they can make them. Many of the tiny shelled creatures form the base of marine food pyramids, so the acid threat to them threatens species at all levels. Ocean acidification is now seen as “an equally evil twin” to global warming, says Jane Lubchenco, head of the US National Oceanic and Atmospheric Administration. Our fossil fuel-based energy systems have grown continuously for so long that they have now grown very large, so large that their carbon dioxide emissions have modified the planet in two major ways. In the period from 1800 to 2013, our fossil fuel burning has increased the carbon dioxide concentration of the entire volume of the Earth’s atmosphere, all 12 billion cubic miles, by 43%. During that same period, the carbon dioxide that was absorbed into the oceans has increased the acidity of all the world’s oceans by 30%. Read those percentages again and let their significance sink in. These are not local changes affecting a few people. These are global alterations of our air and water, astonishingly large changes perpetrated by a single species, the energy-using animal. Since air and water envelop all life on Earth, such changes are altering the patterns of life on Earth, including the lives of humans. We have now come to realize that the energy systems that established human control over life on Earth have unintended consequences that are spinning out of control. In a sense, we have developed an unhealthy relationship with energy: the more we use fossil fuels, the more harm we do. If you feel powerless in the face of such international foot dragging, you are not alone. Fortunately, the top-down approach is not the only way to correct our course. A bottom-up approach is not only possible, it is far more likely to succeed, as you will see in later chapters. That’s because carbon dioxide emissions are primarily an energy problem, and everyone uses energy. If you live a modern lifestyle, then you are a player in this drama. When you drive a car, your exhaust contributes carbon dioxide to the atmosphere. When you turn on a light or use an appliance, the power plant that generates your electricity will burn a bit more coal or natural gas and emit a bit more carbon dioxide in your name. Simply asking people not to drive and not to use electricity to avoid carbon emissions will not work, because such energy use is necessary, not optional. Wasteful energy habits can be corrected, but there is still a baseline requirement for significant amounts of energy to live as a modern human being. Yet our energy requirements do not have to tear up the planet. We can gradually substitute energy sources that are free of carbon emissions. We have such energy sources today, most of which derive their energy from the Sun. Solar panels, wind turbines and other renewable energy sources when combined with energy storage can form a complete energy system for our future, and emit no carbon dioxide. It remains an open question whether we will deploy these new improved energy systems in sufficient quantities to make a difference. Those who know the most about energy say we must, while those who control political and economic power say we cannot. If this impasse is not broken, we will drift into a future not of our choosing, but of our inertia. If we want to avoid unintended consequences, we need to establish a set of intended consequences, and work toward them as a civilization. The good news is that despite the inability of world governments to agree on a path forward, the transition to clean solar energy already proceeds at a rapid pace. The greatest progress is being made by individuals, businesses, and organizations deciding for themselves to switch to carbon free energy. You have that choice too. It is actually easier for you than for big governments and energy corporations. Why? Because solar energy is all around us. You have direct access to an exceptional energy source. It is remarkable that we have failed to see the solution that is falling on our heads every day. That failure comes primarily from our limited view of energy as a consumer item, like soap or potatoes. We buy energy, consume it, and then buy some more. The concept of energy as a consumer item is relatively recent in our long history as the energy-using animal. It grew concurrently with the growth of fossil fuels, a form of energy that can be metered and sold. If we are going to get past fossil fuels, then we will have to get past the simplistic view of energy as just a consumer item. This book will expand your view of energy, and your view of the world through the lens of energy. We start by re-envisioning our past in terms of energy to answer the question: How did we become the energy-using animal? *Wikipedia contributors, “Paris Agreement,” Wikipedia, The Free Encyclopedia, http://en.wikipedia.org/wiki/Paris_Agreement (accessed October 20, 2016).